Mole removal can be done for cosmetic reasons, to put an end to skin irritation, or to prevent or treat cancer. Learn more about the process of removal and discover just how simple it is to rid your body of any unwanted growths with the help of a professional, whether for cosmetic or health reasons. Moles are small growths of skin, either flat or raised. They are often darker than the surrounding skin tone. A mole may be present, unchanged, throughout a person's life, or new moles may develop over time. When a new mole appears on an adult's skin, or when a mole changes in size, shape, or color, it should be checked by a doctor. 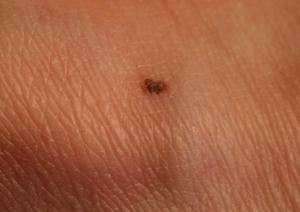 A new or changing mole is a possible sign of skin cancer. The doctor may use a scalpel to cut around the mole, making a sort of oval shape. The doctor will probably use tweezers to lift up the mole, and either the scalpel or scissors to cut it away at the bottom. Then, he or she will close the wound with a few stitches. The mole itself will usually be sent to a pathologist, just to make sure that it doesn't contain any cancer cells. The doctor may use a scalpel to shave the mole off and then use either an electrical tool or a special solution to stop any bleeding. No stitches are needed with this procedure. The shavings may be sent for examination by a pathologist. Your doctor will help you decide which method is best for your situation. Either method may be appropriate, depending on the type of mole and the reason for excision. Both methods are likely to leave scars; scarring depends on skin type, the size of the mole, its location, and the skill of the doctor. One advantage of the shaving method is that there are no stitches to remove, so a follow-up appointment may not be needed. Stitches require removal after about ten days, fewer if the incision is on the face. There is one situation in which complete excision is absolutely necessary. If there is any concern for melanoma, the mole must be cut out and sent to a pathologist for examination. Knowing the depth of a melanoma is essential for planning treatment and predicting the likelihood of survival. The shaving method must never be done on a mole that could be melanoma. The mole makes the person self-conscious. A large mole on the face can be distressing. Multiple moles, or prominent ones elsewhere on the body, can make a person feel unattractive. The mole is in a place where it's easily irritated. A man may have a facial mole that's constantly getting cut when he shaves, or a woman might have one that rubs beneath her bra strap. The mole looks like it could be cancerous. Melanoma, a very serious type of skin cancer, can develop within a mole. Other types of skin cancer may also look like moles. Any new growth in an adult, any mole that has changed in appearance, or any irregular or multicolored mole should be evaluated by a doctor. Your doctor will tell you exactly what to do after your mole removal. In general, you should keep the wound clean and dry. If it becomes increasingly painful, if the skin becomes reddened or unusually warm to the touch, or if you see pus coming from the wound, it may be infected and you should call your doctor for treatment. Be sure to have any stitches removed on the date your doctor recommends. Leaving stitches in for too long can lead to scarring in a "train track" pattern where the stitches entered the skin. Check Medline Plus, from the National Institutes of Health, for more information about skin cancer. The Mayo Clinic has a detailed article about mole removal procedures.